Explaining what is happening in Uganda is no easy task. For Sarah Clement, it is still something she's trying to process, let alone describe to her friends and family back home. 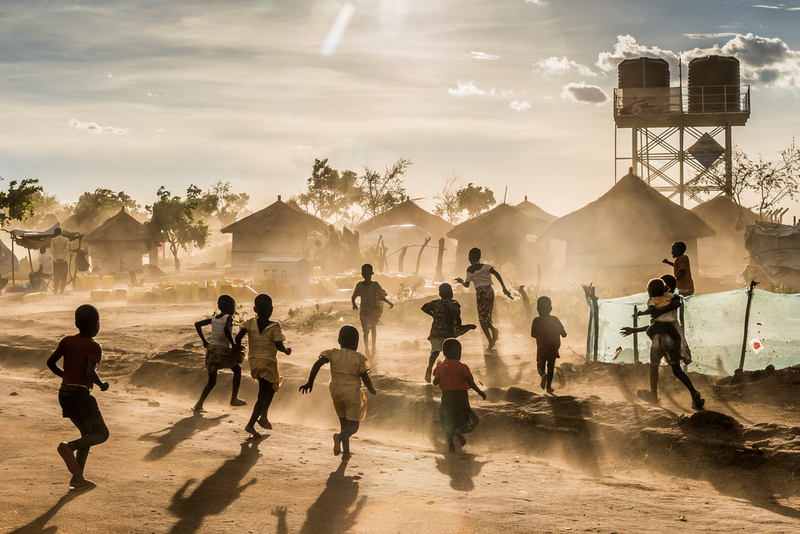 "I post pictures of the [Ugandan] skyline with pretty clouds because I don’t know how to explain the dire situation of the tens of thousands of South Sudanese refugees scattered around these fields," says the Médecins Sans Frontières/Doctors Without Borders (MSF) project administrator. "I post about the sunny views outside our clinic because I know you’d much rather hear about that than about the countless men and women who recount stories of watching their parents, spouses, or children get murdered in front of them. "Telling me as casually as you or I would recount what we ate for dinner last night." Violent conflict in South Sudan has forced hundreds of thousands of refugees to flee to northern Uganda since July 2016. Over 680,000 people have arrived in the country since that date, bringing the total number of South Sudanese refugees and asylum-seekers to one million. As a result, Uganda is now the world's largest host of South Sudanese refugees - making it also the largest refugee hosting country in the whole of Africa. We are currently working in four refugee settlements – Bidi Bidi, Imvepi, Palorinya and Rhino – providing a range of healthcare services, including: maternity care, nutritional care, community health surveillance and water and sanitation activities. During April 2017, we provided 25,775 outpatient consultations, treated 3,307 cases of malaria and produced over 50 million litres of water. Access to water is one of the biggest issues in the settlements, and in response we have been scaling up our water support operations. In Palorinya settlement, we now produce and average of two million litres per day from the River Nile, supporting over 100,000 people. "The world needs to know what's happening here"
Despite our work in Uganda's refugee settlements, there is still much that is needed to fully support the people living within them. “While the Ugandan government is generous in the rights it gives to refugees, the current infrastructure is incapable of fully supporting their need for water, food, shelter, hygiene, and medical care," explains Sarah. "That’s why we’re here. Children play in Bidi Bidi camp. In the background lie some shelters and a water tank provided by MSF. One of the main streets inside Bidi Bidi camp. The wind appears to be rising, announcing a heavy downpour is on its way. A transit centre in Busia town, Uganda, where refugees are driven to Imvepi refugee settlement. It is a two-hour journey by bus. Busia bridge acts as the 'umbilical cord' between South Sudan and Uganda. It is a lifeline for refugees, who pass early in the morning, then return to pick up their luggage hidden on the other side near the border. After crossing the bridge, refugees wait at the transit centre in Busia. Here refugees are welcomed, fed and then driven to Imvepi settlement. Refugees en route to Imvepi settlement. The inpatient department at MSF's health centre in Bidi Bidi refugee settlement. A young boy with malnutrition eats with his mother. An MSF midwife at Bidi Bidi refugee settlement consults an expectant mother. People at the MSF welcome tent at Imvepi camp. Here new arrivals are given health check-ups and vaccinations. To help with water supply across the settlements, MSF has built wells. The water is funneled into various water tanks which people can access. MSF staff speak with a young HIV-positive refugee. Though she is suffering from malnutrition, she refuses to eat. Victor, the doctor, tries to reason with her. Augustin, an English teacher, shows his home in Bidi Bidi refugee settlement.